In the computing world, a raspberry pi is not something you can eat for dessert, and an arduino is not a cousin to a popular robot in the Star Wars movies. But these little electronic gizmos are helping a few of Wyoming’s high school and middle school teachers advance their understanding of teaching science, technology, engineering and mathematics (STEM) in a more hands-on fashion. This past summer, the University of Wyoming’s Department of Electrical and Computer Engineering hosted teachers from Green River and Wheatland high schools, and Burlington Middle School during an Engineering Summer Camp on the Laramie campus. “Our goal is to have high schools use it to teach high-performance computing,” says Suresh Muknallipatna, a UW professor in the Department of Electrical and Computer Engineering. A raspberry pi is essentially a quad core, or a computer on a card that is similar to an Intel processor, Muknallipatna says. 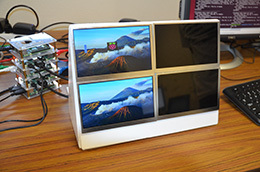 Because they are essentially number crunchers, Muknallipatna says raspberry pis can be used for studies relative to climate change, petroleum exploration, health monitoring and 3-D visualization. A raspberry pi also can be hooked up to a TV monitor and be used to stream movies on the TV; store a number of movies on a hard drive; or play movies from the hard drive on the TV, he says. An arduino, on the other hand, is a computer that has inputs and outputs, essentially “Legos with brains,” says Jeffrey Anderson, a UW lecturer in the Department of Electrical and Computer Engineering. With arduinos, you can apply technology to solve a problem, Anderson says, by designing a system that will collect, record and analyze data. For example, one could use an arduino as a watering system for plants. By purchasing a moisture sensor and sticking it in the plant’s dirt, you can set it up so the sensor sends a signal directly to the arduino, Anderson says. Anderson says students can take the concept a step further. If it gets too dark in the plant’s vicinity, a light could be activated to provide the plant necessary light. Arduinos also could be used to check the temperature of water pipes in your home during the winter or even let you know if your refrigerator is out of beer, says Robert Kubichek, a UW associate professor of electrical and computer engineering. 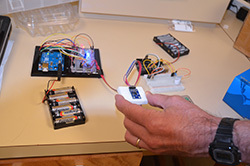 For this fall, Wheatland High School and Burlington Middle School were each provided 20 arduinos for classrooms, while Green River High School was provided arduino-based receivers that students can place at various points along the Green River, Kubichek says. The systems detect and log when radio-tagged fish move by. Students use the data to study movement of trout and burbot, an invasive species. “We want to have kids gain experience with concepts about how technology can be used,” Anderson says. For the next three years, Wyoming high school teachers will come to campus for summer workshops to learn how to use these gizmos and teach their students, Muknallipatna says. Arduinos started in 2005 as a project for students at the Interactive Design Institute Ivrea in Ivrea, Italy. At that time, students at the institute used a BASIC Stamp, or microcontroller with a small specialized BASIC interpreter built into ROM, or read-only memory. It cost $100, which was considered expensive for students. Arduinos, by comparison, cost about $20 or less, Kubichek says. Massim Bonzi, one of the founders of arduinos, taught at Ivrea. The name “arduino” was coined after the moniker of a bar in Ivrea, where some of the project’s founders used to meet, Kubichek says.